Thomas in The Cypress Room kitchen in June. Thomas Tennant began working in the Michael’s Genuine Food & Drink kitchen in September of 2007. Since then, we as a company have grown from one restaurant to four in Miami, one in Grand Cayman, and two sailing the high seas of the eastern and western Caribbean. Chef Thomas has been there through it all, most recently on the rock. After working the line and sousing at our flagship for three years, Thomas chose to accept chef Michael’s mission of opening chef de cuisine in Grand Cayman, not a walk in the park. First, the job required a skilled chef immersed in the genuine ways to make sure Michael’s vision was executed to a “t” in the kitchen. Thomas did so with passion and his endless stream of fearless creativity. He not only led and garnered the respect of his back-of-house team, but also of the people on island, not an easy feat for a foreigner. With patience and determination, he reached out to the community, made friends with farmers, and integrated into island life like pate to crostini. I think we can all agree Thomas earned his stripes. So when it was time for him to return stateside, another mission was waiting for him. Well-armed with his gift of adaptation, our new special ops chef dove head first into a number of Schwartzprojects. First up, Royal Caribbean, and learning the ropes of our 150 Central Park program, including local ingredient provisioning, inputting recipes into its ‘Master Cook’ system, testing them, and finally implementing new menus. 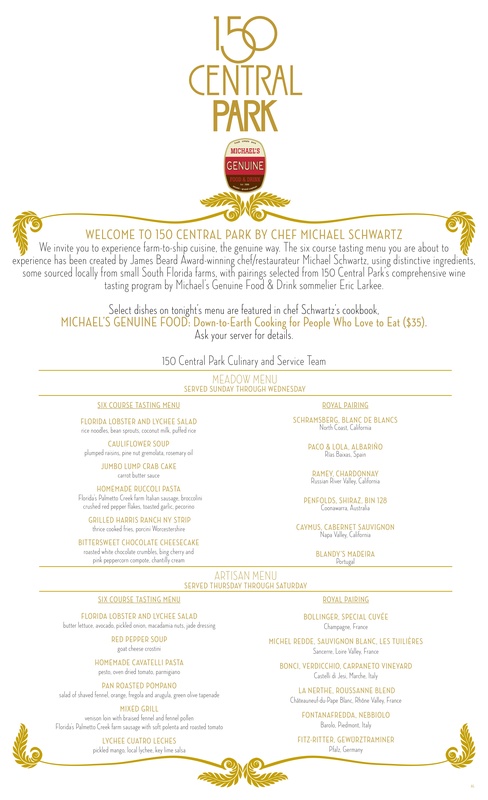 As Ellie previously posted, summer dishes were tested in June alongside Michael, Bradley, and Hedy at The Cypress Room with the help of 150 Central Park chef de cuisine Dominic Bradshaw. Thomas got his first taste of shiplife on Saturday, July 27 when he boarded the Oasis of the Seas for his maiden sailing and service in the galley, implementing summer’s “Meadow” and “Artisan”. With Michael, Eric and I heading out on sister ship Allure of the Seas this Sunday to do the same, and Thomas at the gate in MIA waiting to board a flight to check back in with Grand Cayman for a few days, we rang him up to chat about his impressions of shiplife — from what happens when the pasta machine breaks down 10 minutes into prep, to how many languages he can now say “Thank You” in. TGK: So when I tell people I’m heading out on a sailing, they think of poolside daiquiris and a great tan. “You’re going on vacation!” they insist. Thomas Tennant: Yea… no. You kind of work all day. You work, you work, you work, you take a break and then you work again. TGK: Were you prepared for the experience? Was it what you expected? TT: It’s a very diverse crew, very international. Lots of Filipinos and Indonesians, some Europeans, and lots of island people. It was something familiar from living in Grand Cayman, so in that way it was a smooth transition in terms of learning how to communicate and work with the staff in the galley. I also made sure to get off the ship for a few hours when we were in port, especially in St. Thomas which is a US Virgin Island, to take advantage of the cell service! TGK: What is the key to survival on the ship as a chef? TT: The key is making it work through adaptability… Sometimes you don’t have an ingredient so you need to be flexible and use good judgement. Some employees are still in training mode, but they are open to constructive criticism. They have a strong work ethic, and everyone is open and welcoming. Shiplife is all about the ultimate hospitality, not just to the guests, but to each other as crewmates. Everyone lives together and works together. That’s over 2000 employees, and you become acquainted real quick. By the end of that week, I was already speaking three new languages. Everyone is friendly if only just by virtue of having to get along. The worst thing you can be disciplined with a notice from the captain. No one wants that! TGK: Talk to me a little about what it’s like working in the galley? TT: There’s a little bit of translation from the written recipe to application that needs to happen for the staff to understand. They read the recipes, and because English isn’t their first language, you tell them to butter a steak, and they may think you mean to put a pat of butter on it. All of them have some sort of classical training before they get on the ship. I can’t tell you how many cooks would come up to me and show me their certifications and paperwork from the courses they passed. The galley at 150 has the cream of the crop. The cooks there want to be there and it’s sort of a badge of honor. The most important thing is the discipline and structure. No one would dare question the chef’s direction. That just does not happen. The culture is very different in that way from restaurants on land. The captain is the only 5 stripe officer on the ship and the chain of command descends from there. You have 4s and 3 1/2s and so on… These controls allow the ship to function. TGK: Did anything go wrong that you were forced to adapt to on the fly? Ingredient-wise, the only thing that didn’t make it on the ship were the bing cherries so we use Amarena instead. cherries… Michael showed us another way to form the ruccoli pastas, and one of the comis (line cook) did it differently, sideways with his fingers, but it achieved a better result because it was more efficient. Michael is always pushing the team to work better and innovate no matter how seemingly small a task may be. We make thousands of pieces of ruccoli pasta… so every second counts. Also our cavatelli machine broke within 10 minutes of using it. I thought to myself oops we’re on a ship, there’s nothing we can do about it. But the guys called engineering and after little welding and readjusting on the gears, it actually worked better than before! TGK: How has the response been to the new menus? Any dishes in particular stand out to you? TT: One of my personal favorites is the rock shrimp salad at MGFD, and it translated really well with the lobster salad… That dish was the most talked about! Everyone really loved that, especially the jade dressing. The venison and the sausage also came back with a lot of clean plates, if they order it. Substitutions on the ship especially in the main dining room are par for the course so that was something that required getting used to. Also Hedy’s quattro leches. Oh man, I didn’t stop hearing about that one!